Marine biologist Ari Friedlaender tags whales as part of his research on humpback whales in the Antarctic. Ari Friedlaender, a marine biologist with University of California, Santa Cruz, writes, "Because of the shutdown we were not able to get our permits completed and signed so we are hamstrung from collecting some critical data and deploying tags on whales to study their behavior and population structure." 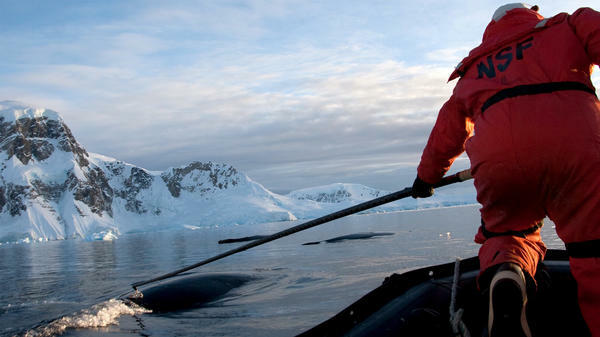 The research, he says, involves placing motion-sensing tags on humpback whales in the Antarctic "that measure their underwater behavior and feeding rates and allow us to understand how these animals behave and are affected by environmental change and how these changes might put them into competition with other krill predators like penguins in certain areas." Friedlaender says he was hoping to get the permits before heading out into the field. "Since [humpback] whales are federally protected, we require a handful of permits to do research with them and with the shut down the folks in the permit office simply couldn't get things done for us." Now, he says, he can't communicate with people at the National Science Foundation he needs to. "We have people in the field that can't do what we intended to do," he says. "Very sad and debilitating feeling for sure." Update, 4:45 p.m., ET: Since publication, Friedlaender has received word through an independent contractor that his whale research permits have been approved and his team can resume their work immediately. "I already called the field teams and passed on the good news" he says. He's especially grateful to the contractors who helped with permitting. It shows, he says, "with enough people working hard among the chaos that things are getting done."